I had a wonderful week-end filled with a returning husband, entertaining baseball, shopping at Costco, running along the Centennial Trail, and the realization that I think we have a family of Rough Legged hawks in our vicinity. Norm made it back safely from his first solo business trip. Guess what he brought? 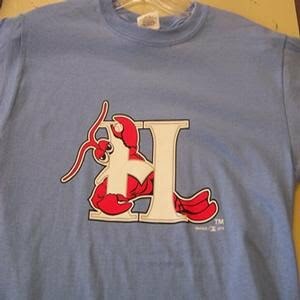 A t-shirt from the Hickory Crawdads!!! Who are they? Well they're the next level up in for our own Spokane Indians in the Texas Ranger's organization. Norm even saw some of our players from last year. The funny thing is, he says that our stadium experience is so much better than the next level up. How about that? We are so fortunate. Friday night I went to a baseball game and was highly entertained, not by the play but by the opposing manager. To say that he did not agree with an umpire's call would be an understatement. First he argued. Then he kind of danced up and down. Then he pumped his fists and danced up and down. At that point the umpire tossed him. Ah, but the show had just begun. The manager took is lineup card, folded it neatly and stuffed it in the umpire's shirt. Then he did my favorite thing: he kicked dirt. He actually kicked dirt. (This picture is not from our game. I think it's Lou Pinella) I thought we were at a Dodger's game (or maybe it was the Yankees). Apparently kicking dirt was not enough for him, so he took off his hat, threw it on the ground, and kicked it, again, and again, and again. Then he walked up to a spectator (I kind of held my breath at this point), and.....shook his hand. Walking over to his dugout, he took off his cap and kicked it again. 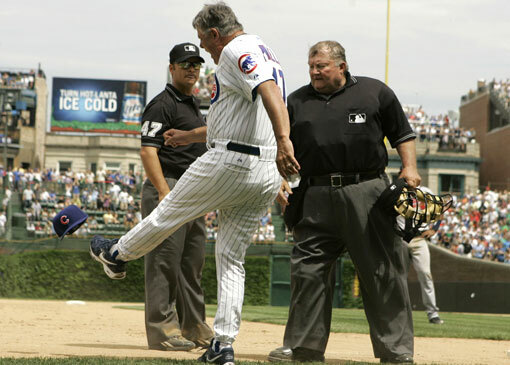 Instead of walking into the dugout, he walked passed it towards the spectators near the bullpen. At this point the funniest thing of the whole spectacle happened. As he passed beyond the view of his players in the dugout, they all stood up and came out of the dugout to see what their manager was going to do! Fortunately, he began shaking the hands of four or five spectators along the third base side. Finally, he took a bow or two before all of the spectators and left the field. At that point, spectators, umpires, and players all kind of shook ourselves, brought back to the realization that, oh yeah, we're still playing a baseball game. I laughed till tears came to my eyes. I have cherishing my time lately, painting, drawing, exercising, sitting on the deck. I've realized that there is a new sound outside and I think I've identified it as Rough-Legged Hawks. There must be a nest nearby. I think that the babies have just begun flying because Norm and I say them flying around yesterday, calling to each other. What an honor to have them in OUR backyard!! The story of that manager just made me laugh out loud! It almost makes me think it was some sort of dare...how bizarre.